Can you use it for indoor or for camping? What to look for in a wireless dog cover? Caring for a dog not only requires time and effort. Dog owners will also have to invest in stuff like puppy shampoo that can keep their canine friends clean. Or things such as a wireless dog fence that has become quite a necessity these days. A wireless dog fence is a modern apparatus designed to keep a dog in the yard. This is a good tool to have if you’re worried about the security of your dog. The good news is that wireless dog fences have become more affordable these days thus you don’t have to break the bank, so to speak, to get one for your pet. It’s also a more practical way of securing your pet as you don’t need to dig up or lay down a perimeter wire in your yard. A wireless dog fence may look complicated at first but don’t worry; it isn’t as intimidating as you think it is. 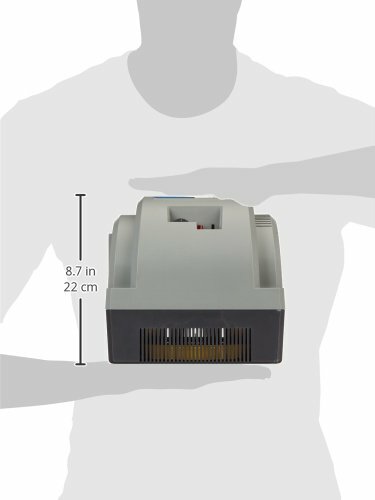 This apparatus typically comes with a transmitter which you can place anywhere in your house. The transmitter emits a radio signal that works like an invisible fence. 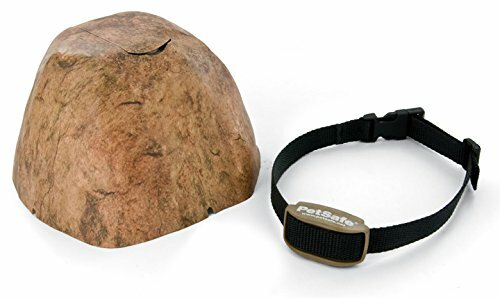 The other part of a wireless dog fence is a collar which you’ll place around the dog’s neck. The collar receives the radio signal from the transmitter. Your pet is free to roam around and play as long as the collar is receiving signal. The collar, however, makes an alarm once the dog goes near the boundary of the invisible fence. If the dog goes beyond the boundary, a light static energy pulse is transmitted. This pulse is not harmful at all. It’s often startling enough to deter the dog. With a little training, your pet would eventually learn his boundaries. Wireless dog fence can also be used indoors. Whether you want to train your dog to avoid the living room or keep him off the counter, a wireless dog fence can be very handy. With an out of sight dog fence, you can protect expensive furniture or important documents. You can also use a wireless dog fence whenever you bring your dog outdoor, especially when camping out. It’s a practical and easy way to prevent her from wandering off your camping area and potentially causing trouble for other campers. With a wireless dog fence, you can teach your dog the boundaries of your campsite. You won’t only ensure the safety of your pet but also of other people. Now that you have a better understanding of how a wireless dog fence works, let’s look at the different factors you need to weigh in when shopping for this product. Perhaps one of the most important considerations in choosing a wireless dog fence is the how much space it can cover. Some models have coverage of an acre while more expensive models cover two acres or more. One of the main reasons why a lot of pet owners prefer to use a wireless dog fence is because they don’t have to hammer or dig anything in order to build a real fence. As such, the ideal wireless dog fence is easy to install. It should take less than an hour to have everything up and running. You ought to get a wireless dog fence that would let you program your other dogs into the system. It doesn’t make sense at all if you get a pet containment system that only works for 1-2 dogs when you have more than three pets at home. The collar receiver must fit with your dog’s neck. It should be waterproof and durable. The battery of the receiver may also affect your decision. Ask yourself - - do you prefer a collar with rechargeable batteries? Or are you fine with buying disposable batteries? Most manufacturers offer a one year warranty, but I wouldn't blame you if you buy a unit with a lifetime warranty as you can get yourself protected in case the product turns out to be a lemon. This is a good model if you don’t exactly have a big lot as it can cover up to half an acre. I also like that it has a waterproof receiver collar. The said part of the system includes a low battery indicator, which would let you know when it is time to change the battery. It is also easy to set up. You can have the system up and running in as little as an hour. Going back to the collar, it makes a beeping noise that would alert the dog if she closes to the boundary. It fits pets who are 8 pounds or heavier, and dogs with neck sizes six to 28 inches. Plus, you can add an unlimited number of pets to the system as long as they wear this receiver collar. Training your dog to get used to this system should be a breeze what with the five levels of correction and a tone-only mode for training. This shares similar features with the preceding item. It also has the same five levels of correction and tone-only mode. Both features are designed to make it easier for pet owners to train their dogs in getting used to this system. 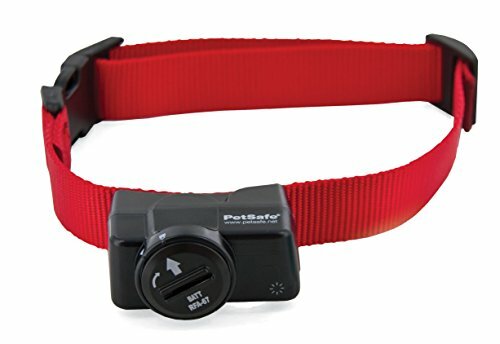 Like the PetSafe Wireless Fence Pet Containment System, it can also accommodate an unlimited number of dogs as long as they are made to wear the receiver collar. However, the collar in this system is designed for smaller dogs. It can also be worn by dogs weighing five pounds or more. The collar is rechargeable with each charge lasting for weeks. Recharging the collar would take about 2 to 3 hours. Another difference is that this wireless dog fence has a slightly bigger area of coverage, as it can cover up to ¾ acres. UNSEEN AND EFFECTIVE DOG TRAINING: Teach your dogs to behave in the easiest manner with no frustrating episodes. If your pets have proven stubborn and hard-to-train, trespassing spaces they're not supposed to be in, our wireless electric fence will quickly set boundaries, and train them to learn the off-limits places for them. Add an unlimited number of collars! LATEST ELECTRIC FENCE TECHNOLOGY: With our containment system's in-ground fence cords, you will be able to easily set up an hidden boundary for your pets. Our transmitter device is attractively designed, uses the latest radio wave technology and offers 5 correction levels for precise training. You will have no trouble setting it up quick and easy, using our clear and detailed instruction manual. LONG AND CUSTOMIZABLE RANGE: The unit comes with 955 foot of solid copper wire enough wire to cover 1.2 acres. With our system's in-ground cord, you will be able to cover the exact area you want, without the troublesome radio holes of cordless alternatives. Place the cord in shallow ground around the precise space you need to protect, and our transmitter will do the rest. Our transmitter can properly service up to 5 acres, should you acquire more cord. This is the wireless dog fence you’ll need if your yard measures more than an acre. What I love about this system is that it comes with in-ground fence cords that make it easier for you to set up an invisible boundary. The cords also serve another purpose—it allows the system to cover the exact area as desired by the pet owner without interference caused by radio holes. Setting it up should not be a problem as it comes with a detailed instruction manual. The transmitter of this system also provides five correction levels which can help users in training their dogs. The collar is also well-made. It needs 2-3 hours to be completely recharged, but takes about 3 days before the battery gets drained. Do you have one or two big dogs at home? Then this could be the pet containment system best suited for your needs. 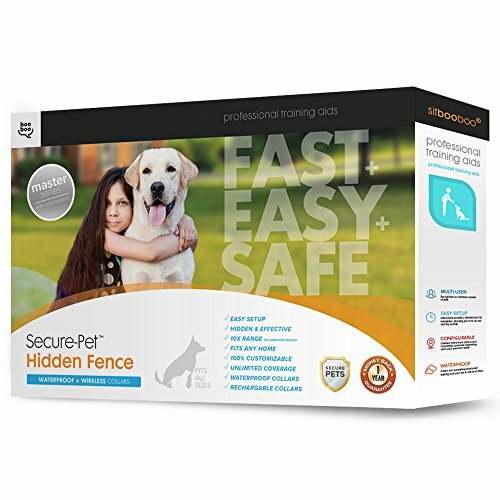 This wireless dog fence is suited for dogs weighing eight pounds or heavier, so you can use this with your big hound or Labrador. You can also add more dogs to the system, but you'll have to buy separate collars. The collars included in the package are also waterproof. You’d need a 6 volt battery to operate the collars. That’s great if you always have a battery around because you don’t need to recharge it. But the problem is that the batteries don’t last long, which is one of the few gripes pet owners have with this system. This system doesn’t have the best coverage, though, as it is only designed to cover an area of up to ½ acre. Like the item preceding it, this wireless fence is more appropriate for indoor use. It can train your pet dog to stay away from areas up to 8 feet away from the transmitter. The transmitter is waterproof and powered by four D batteries. The collar, meanwhile, needs two lithium batteries to work. It fits dogs more than five pounds. This system employs a warning tone that is audible enough for dogs to hear. The tone automatically stops after 15 seconds, meaning the dog won't likely be scared by an extended alarm. Now you might ask me: which of these models I would pick if given a chance? 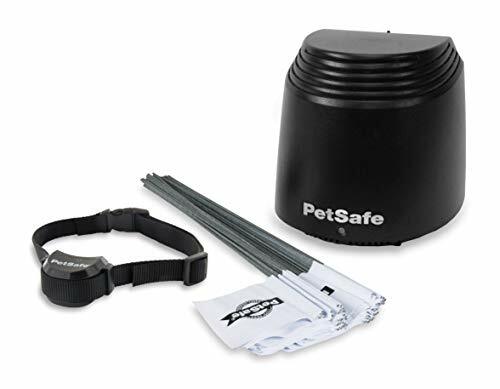 I'll go with the PetSafe Stay + Play Wireless Fence. I believe that it is the best in terms of range, ease of installation and build quality of the collar and transmitter. The others are quality wireless dog fence units in their own right, but they pale in comparison to the PetSafe Stay + Play Wireless Fence. How about you? What is your pick among these wireless dog fences?